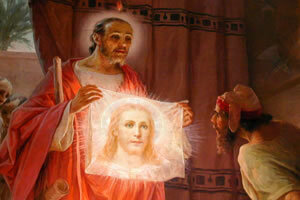 Since early Christian times there have been oral and written reports of a cloth bearing the image of Christ’s countenance passed down over the centuries. The veil of Kamulia, Mandylion, Acheiropoíetos, Veronica or Holy Face - a multitude of arcane designations, some of which were also used for early icons, make the search for the genuine article in documents, legends and poetry more difficult. Moreover, several cloths were found in the grave after the resurrection, as John explicitly mentions in his Easter Gospel a bundled (or folded - the Greek word “entylisso” is used) sudarium in addition to multiple linen cloths. No images on these cloths were mentioned. Any mention of them would have greatly endangered the existence of the cloths in Jewish Jerusalem, because materials from graves were considered extremely “impure” under the Jewish purity laws, and also because these images appeared to violate the Jewish prohibition of graven images. The following comments are restricted to the references throughout nearly two thousand years of history that could be related to the cloth of Manoppello. Some of these are assigned to the sudarium of Manoppello because it has a more manageable format (24 x 17.5 cm) than the shroud of Turin (437 x 111 cm). 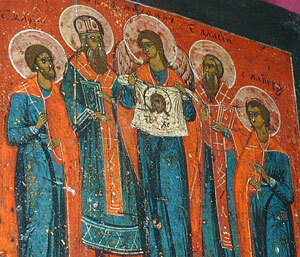 It is reasonable to assume that Mary initially took the shroud with her to Ephesus after the death and resurrection of Jesus.A Georgian text from the 6th century states that she received from the hands of God an image of the handsome face of her son left on a shroud, which she set up facing east for prayer. 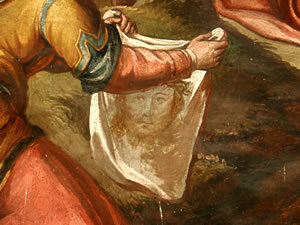 Various legends claim that King Abgar V of Edessa (4 BC-7 AD and 13-50 AD) was given a cloth with a portrait of Christ. According to historical narratives, this cloth was in Edessa (now Turkey) for 400 years. During the Persian siege of the city it was removed from its walled hiding place in 544, saving Edessa from the Persian army. 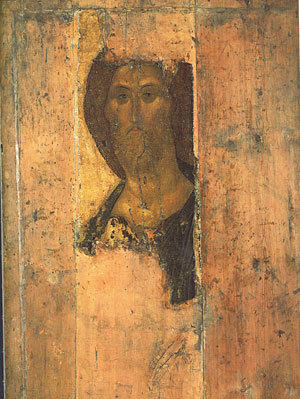 From this point onwards, the portrait was known throughout the Byzantine empire as the Mandylion (“mindil” means “cloth” in Arabic) or the veil of Kamulia, after it was taken from that city in 574 to Constantinople. In the 6th century it was reported from Memphis, Egypt that there was a linen cloth there on which Jesus had left an imprint of his face when wiping it. According to the report, it was almost impossible to look at the image because it was changing constantly. This characteristic recalls the cloth at Manoppello. At the end of the 19th century, numerous mummy images which are considered forerunners of the icons were discovered precisely in this region of Egypt. In 586 Theopylaktos Simokattes described the cloth as divine art in which neither the hands of a weaver nor the paint of an artist were used. 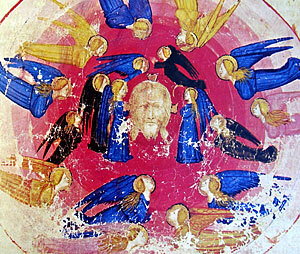 Around 594, Evagrius Scholasticus designated the image of Christ from Edessa in his historical narrative as “an image created by God, untouched by human hands” and the veil of Kamulia was also known as the acheiropoíetos (“not made by human hands”). During the period from 574 to roughly 700 the acheiropoíetos functioned as the imperial palladium in Constantinople and was used to motivate the troops in battle. In the late 7th/early 8th century the veil was no longer safe in Constantinople and ended up in Rome, where it became known as the “Veronica”. The relic has been kept in the Vatican since 1204.
or fu sì fatta la sembianza vostra? Now was your semblance made like unto this? per che ´il mio viso in lei tutto era messo. Not knowing that the image on the cloth disappeared with backlighting, Martin Luther railed against the popes in 1545 because they presented only a “klaret lin” (a blank cloth) as the veil of Veronica to the pilgrims.